On 15 March 2007, I received the IC-R9500. It is an extremely versatile piece of equipment that can also be used as a test instrument. The model I have can receive any TV system (the various PAL systems, NTSC, SECAM). It is ideal for satellite TV reception and for monitoring TV signals transmitted on strange frequencies. The band scope is a really fantastic feature which can be used to scan a very broad part of the RF spectrum, or if one wishes a particular segment to monitor RF activity in that selected spectrum. One can quickly determine HF openings with this feature or transmissions on SHF bands such as satellites. The scope can check signal strengths, bandwidths, RF activity etc. The receiver can be used in conjunction with another Icom transceiver. The frequency and mode settings will follow when either radio is changed. So you can use your IC-7800 to transmit and the IC- R9500 to receive. (The IC-R9500 is a superior receiver to the one used in the IC-7800. It has 5 roofing filters versus 3 in the IC-7800). It has a built in front panel speaker giving excellent audio quality. Bass and treble can be adjusted to suit your particular preference. Listening to short wave AM transmissions using the synchronous AM mode are as close to FM quality as one can get. The normal fading one experiences using normal AM just vanishes. The Receiver also receives [APCO] P25 digital modes with the UT-122 digital unit installed (at an extra SAR 1400.00, equivalent to USD 190.00). A total of 4 "S" meter types are available in the IC-R9500. Normal S- meter, dBu (dB above 1µV), (EMF), and dBm scales can easily be switched into circuit depending on what you wish to measure. 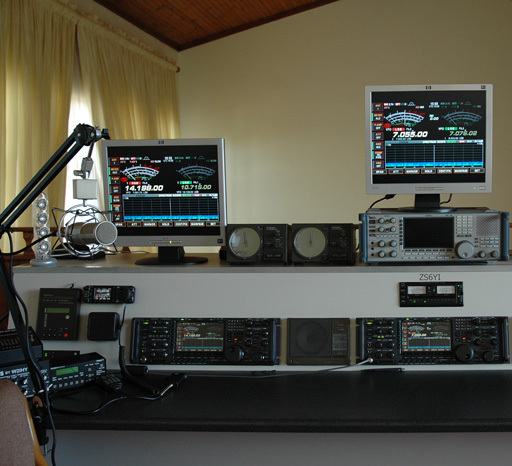 RTTY can be decoded without the use of external modems or decoders. Another handy feature is the two types of voice recorders incorporated into the radio. The first is a regular digital recorder for long continuous recording, and the other is a short recorder which temporarily stores the previous period (up to 30 sec). The memory and scanning options are features that really make this radio unique. It is ideal for tracking and capturing short transmissions on strange frequencies. There are many more scanning features which will need a separate discussion to elaborate on them all. I have only had a few hours playing with the radio so I have not tested all the features. Fortunately the controls and operating logic is very similar to my IC-7800 so the learning curve has not been too steep. The handbook is very well written and quickly takes you to any subject you may be interested in and in no time at all you have that particular issue sorted. The dial has a neat click function which resembles the feel of a channelized dial if you wish. This feature can be turned off if you want to spin the dial. In a nutshell, this radio is worth every cent even though it costs around SAR 20 000.00 (USD 2770) more than the IC 7800 (.......and has no transmitter). As I become more proficient with the radio I shall be happy to share my experiences with anyone interested in this particular masterpiece. On 7 April 2007, I took some interior photos of the IC-R9500. They can be viewed here. Download my IC-7000 South African PAL TV modification. Copyright © 2007-2018, G. Immelman ZS6YI (including image). All rights reserved. Text editing & page creation: A. Farson VA7OJ/AB4OJ.